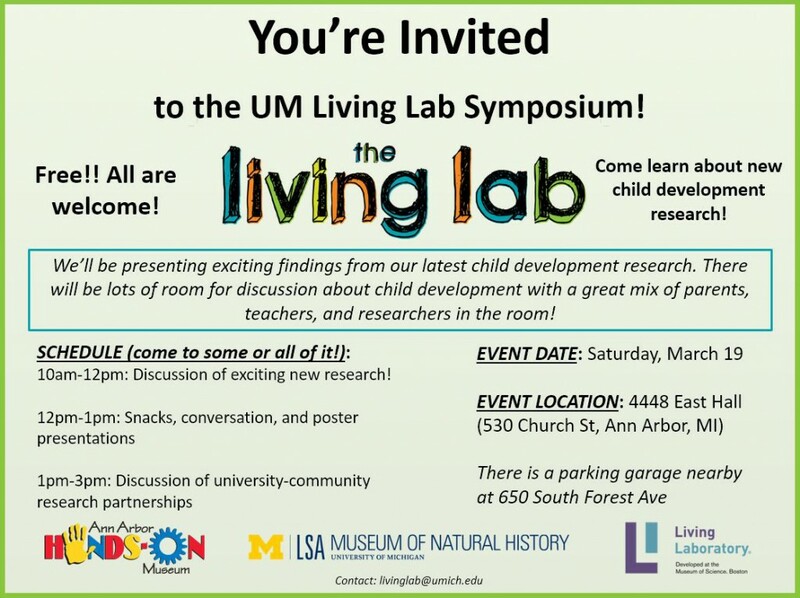 UM child development researchers who work in the Living Lab Program will be presenting exciting findings from our latest studies. There will be lots of room for discussion about child development, with a great mix of parents, teachers, and researchers in the room! Child development researchers from UM who have been conducting research on social cognition and behavior with children in the Living Lab Program (at the Hands-On Museum and at the Museum of Natural History). 4448 East Hall (530 Church Street, Ann Arbor, MI 48109). There is a parking garage nearby (650 S Forest Ave). We’ll hear from researchers conducting studies in the Living Lab. Each researcher will give a short, dynamic talk about a study that’s been run in the Living Lab. These short talks will be fun for everyone involved, and are geared toward a diverse audience that includes parents, teachers, and other researchers. The presentations by individual researchers will be capped off with a talk by Professor Susan Gelman (dept. of psychology). Snacks, conversation, and poster presentations of recent research. A discussion of the nature of university-community research partnerships, and how to continue building partnerships like the ones we have with local museums. This part of the day will feature a talk by Marta Biarnes, one of the pioneers of the Living Lab model at the Boston Museum of Science.